Carl Struthers graduated with a M.Sc. (Honours) from Victoria University of Wellington in 2005 after completing his thesis on the “Effects of Marine Conservation on blue cod populations at Kapiti Island Marine Reserve”. He first joined the Te Papa team in early 2005 on a short-term technical contract working on Ross Sea fishes. In July 2006, Carl took up his current role as Research and Technical Officer: EEZ Fishes. 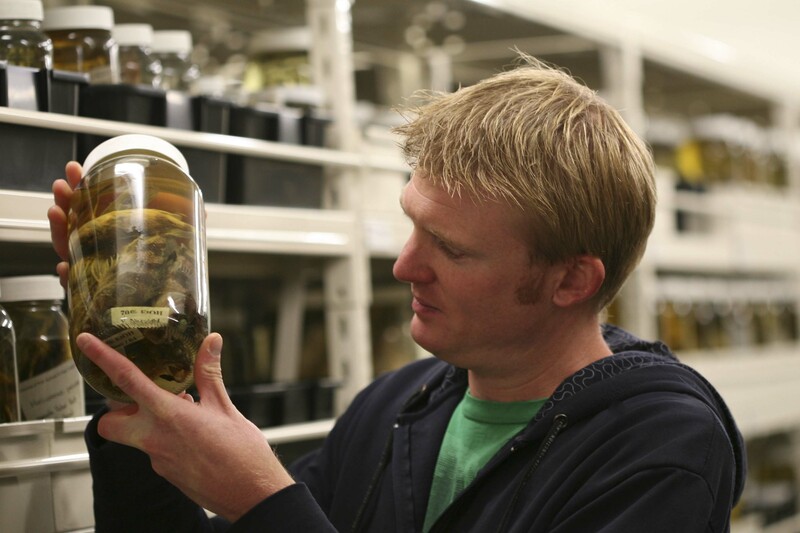 The work mainly involves assisting and coordinating the collection-based research of specialist fish taxonomists studying New Zealand’s fish fauna. In addition Carl also spends time taking digital imaging and radiography of fishes, database development, specimen field collection and research on problem species groups. Currently, Carl is working on Australasian scorpionfishes, in particularly seaperch (genus Helicolenus) and Australasian morid cods. He is also a co-editor of the comprehensive guidebook Fishes of New Zealand (in preparation). What do you hope to achieve on this expedition to the Kermadecs? We hope to collect a wide range of fishes from the Kermadec Islands to help us as scientists to better understand the fauna and try and understand how it is related to both New Zealand fishes and others from the Southwest Pacific. It is an area that has been poorly sampled in the past, and we hope to find several new species and new records for NZ waters. Personally, I am interested in the scorpion fishes of area, as these fishes are underrepresented in the collection so far, and I predict that there are a couple of new species waiting to be discovered. In addition, I hope to take fresh colour photos of all the species collected to be used in the upcoming guidebook Fishes of New Zealand. What skills are you bringing to the team on this expedition? Our team brings a wide range of skills that will add to the team and make the expedition a great success. We have experience in collecting fishes using SCUBA and also in the wide range of other collecting methods that are to be used during the trip. In addition to these, we have more specific museum related skills in accurate identifications of species, making sure that the specimen are correctly registered and preserved, and taking of colour photos of the fishes for future study. When you’re not on an expedition what does a “day at work” look like for you? My job is rather exciting as it varies from day to day. The main focus, as co-editor of the comprehensive guidebook Fishes of New Zealand, is focused on this project. This involves either helping with or undertaking researching on different groups of New Zealand fishes. These jobs may include counting and measuring different characters on fishes to enabling correct identifications through to photographing and x-raying fishes to assist with new publications. Currently, I am working on two groups of fishes the scorpionfishes, in particularly seaperch (genus Helicolenus) and morid cods as there are several problems in these families in our region.